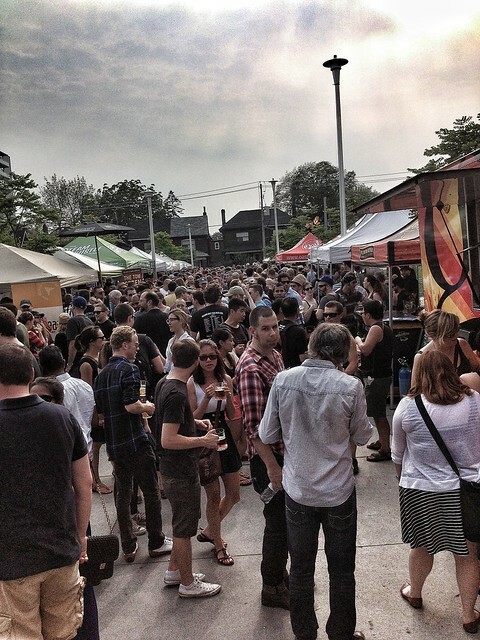 This past Saturday was the Session Craft Beer Festival, which is more or less an after party to the Ontario Craft Beer Week festivities. Last year featured some of the best and brightest breweries from all over Ontario showcasing special one-offs and this year was no different. The festival included a wonderful selection including beers for consideration in the in-fest competition Collaboration Nation, where breweries teamed up with Ontario celebrities like the badass TV personality Ed the Sock, Well-known horse masturbator Tom Green, Canadian Singer-Songwriter City & Colour and Toronto Star Beer Columnist Josh Rubin for a chance of their beer being picked up by a handful of LCBO stores. This year’s event was packed. More than a thousand arrived for the event at Wychwood Barns and the event was shoulder to shoulder. Amazing for the organizers and for anyone looking for a sign that craft beer is only going to get bigger. My one big suggestion to the organizers for next year (and one that they are very well aware of by now, I’d wager) would be to find a bigger place so folks can spread out a bit better and even separate if there are individual things going on. Beer Writer and Prud’homme Beer Sommelier Crystal Luxmore, who I deeply admire and look up to for her insightful view on the drink we love, led a tasting with hot dogs and a selection of beers. Although the talk was wonderful, I feel it would have been better in an area with better acoustics. Equally so with Black Oak Brewery’s Sonja North and Erica Campbell’s talk on IPAs. In the end I got the sense that, with two stages for live music/talks, food trucks galore, a volleyball court and incredible beer, the organizers planned big but, to be on the safe side, chose a space that was too small. Don’t get me wrong though, of all the problems that a festival can get, “too crowded” is a really good one to have. I wasn’t prepared for the onslaught of beer lovers for this event and seeing the overwhelming love for quality beer was incredible. In the crowds I managed to strike up conversations with some fantastic people (including an adorable couple that met during Ontario Craft Beer Week) and got a good insight in to the general public’s way of looking at beer. 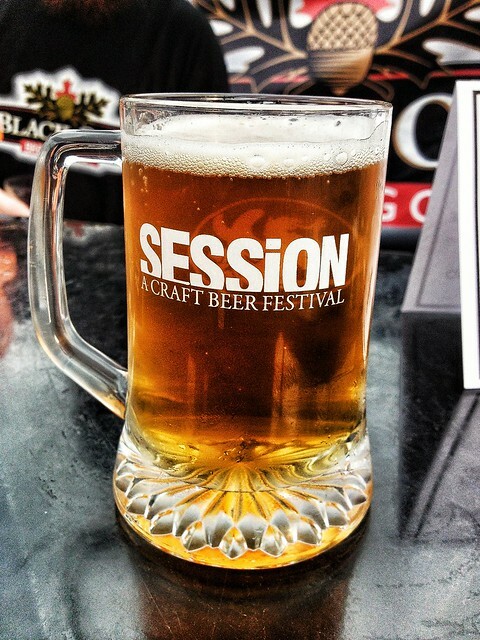 Session is a festival that keeps showing the rise of the Beer Geek in popular culture and I love the hell out of it. Although the winner of the Collaboration Nation competition was The Tom Green Beer, a milk stout by Beau’s All Natural Brewing and Tom Green, I had many highlights, including “Allison Brier”, a Raspberry Saision by Sawdust City Brewing and Edge 102’s Fearless Fred, “Lion Grass”, an earthy beer made with lemongrass and Dandelion leaves by Highlander Brew Co. and Durham Tourism Manager Kerri King and “Red on Red”, a stunning Imperial Red Ale by Flying Monkeys and Central City Brewing. It was a fun, inspiring, and above all an optimistic day. 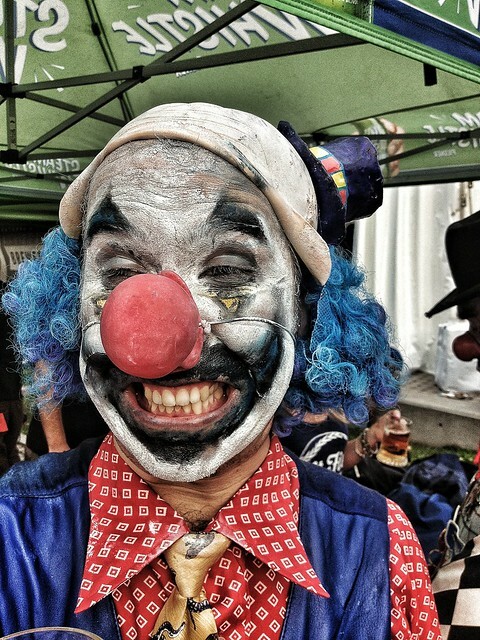 …there was also a scary clown. Nice recap. It was nice to see so many people out but still way too crowded! Oh, definitely. Hopefully they find a better balance for it next year! The Sawdust City Raspberry Saison was wonderful.